Let’s skip the first two subjects since a certain presumptive presidential feeds the media more than they can digest in an average news cycle. 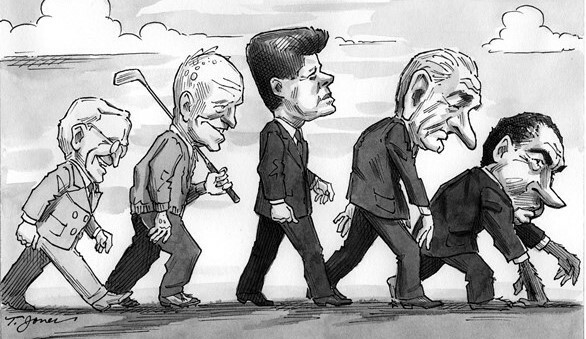 As you’ll see, the InsideGov “experts” ranked the most successful U. S. presidents since FDR. You’ll note that, somehow, someway, they decided that LBJ ranks ahead of FDR who, virtually every historian would agree, was among our nation’s five greatest presidents ever. The LBJ choice is laugh out loud funny. Let the record show that LBJ’s Great Society collapsed under its own weight. And, his misguided decision to listen to his generals and escalate the Vietnam War to the point where half a million U.S. servicemen were based there and 50,000 more lost their lives speaks for itself. But, it was LBJ’s tone-deaf response to the growing hostility to the war by college students and respected political leaders alike, that tore the nation apart and led to his being hounded from office. LBJ was our greatest president since 1933? That’s like saying Angelina Jolie is America’s best actress since Bette Davis. Note that a disgraced figure such as Richard Nixon finishes in the highly respectable eighth spot. And, ranking Eisenhower third also is a real head-scratcher. Ike was a guy who basically served as caretaker while the post-World War II, rich-beyond-it’s-wildest dreams U.S., totally dominated every global economy industry worth noting. A competent librarian could have managed that ship of state. I agree with ingov’s decision to place Carter and W. at the very bottom. The former totally bungled the Iranian hostage crisis while simultaneously plunging the U. S. economy into its worst state since 1929. And, say what you will about W., his ill-conceived invasion of Iraq set the stage for today’s total power vacuum in the region. W. also allowed Wall Street to run amok which, as we now know, led to the housing market bust, the collapse of Lehman and the need for the government to bail out Detroit and Wall Street alike. That’s some legacy. I think Harry Truman should hold down the number two spot. In addition to integrating the Armed Forces, Truman feared no one and famously fired the dictatorial General Douglas MacArthur, when the latter publicly defied Truman’s commands during the Korean War. I find the list fascinating since image and reputation also factored heavily into the final results (i.e. Reagan’s and JFK’s favorability ratings remain off the charts and clearly impacted their final standings). But, in terms of who did the most for our country during his time in office, there’s FDR, and then there are the 12 also-rans. Please weigh in, and tell me why you vehemently disagree with me and, if given the chance, would create a totally different list. And let’s try to keep politics out of rankings the past 13 presidents. Cite the reasons why you either agree with ingov’s rankings, mine or neither. And a tip o’ Rep’s cap to “Give ’em Hell” Powers for the idea. Franklin Pierce never got his due. Thanks for the tip, Peter. I’ll check out the book. This survey that makes LBJ number one without mentioning the Civil Rights Act, when the rest of his Administration was a free-fall disaster. That makes its rankings irrelevant to me. FDR should be first, Truman second, then Eisenhower, Clinton, with Reagan, Obama, Nixon, LBJ after. JFK and Ford deserve asterisks. The bottom seems about right. The Civil rights Act was JFK’s baby. Congress pushed it through ASAP in his memory. It was a no-brainer for LBJ to claim credit for it. I love observations from across the pond. I agree wr’ll never know about JFK and how he would have spent his remaining five years in the White House. But, historical facts are historical facts. LBJ is responsible for escalating a minor skirmish in Vietnam to an undeclared war that resulted in 53,000 Ameticans killed in combat and a nation torn asunder. And, Nixon was caught dead to rights about both leading, and then covering up, the Watergate scandal. Ike did nothing since he didn’t have to do anything. FDR, like Lincoln and Washington before him, led the nation through cataclysmic times. W helped foster in a cataclysmic time and I’m not at all pleased with how Obama has handled it, but these rankings simply ignore the facts. Btw, my best to QE II on her upcoming 90th. Might she be interested in running for president? Hell, I’d vote for Ricky Gervais at this point. I’m picking up Jean Edward Smith’s “Eisenhower In War and Peace” from the library. Have you read it? My understanding is that it re-evaluates Ike’s Presidency to argue common interpretation that he wasn’t just a mere caretaker. It’s all subjective I guess and depends on what one rates as admirable qualities. I always thought Abraham Lincolns quote ‘I don’t like that man, therefore I need to get to know him better’ sort of applies both ways. Leaders that were once revered turn out to be corrupt despots and sometimes vice versa. Nixon always suffered because he was not as ‘beautiful’ as JFK…had the latter lived longer who knows how he would have been perceived? What continues to beggar belief is that a truly great country, who puts freedom of speech and democracy at the top of its value tree could choose, with total free will, such toxic presidential candidates. Where, will whoever wins, rank in future?